Draw a beautiful clipart hat created from simple curved lines and filled with all the basic effects like shadows, highlights and textures. This fun object might seem easy to create at first. However, there are a few tips to be aware of. Sketching relevant textures and adding believable shadows is not as easy as it looks. In this lesson, I will show you how to turn a basic illustration into a beautiful picture loaded with details and simple patterns. First, we need to sketch the object itself. Only a few lines are needed. To speed up the process and make the object symmetrical, you can create an imaginary line in the middle and sketch only one side of the hat. Then, duplicate these new lines to create the other side. Once all lines are joined, you should end up with something like this (see below). Don't forget to draw a stripe in the middle of the cartoon hat. You can also sketch two long curved lines inside the object to create small bumps. For now, only plain colors are needed. 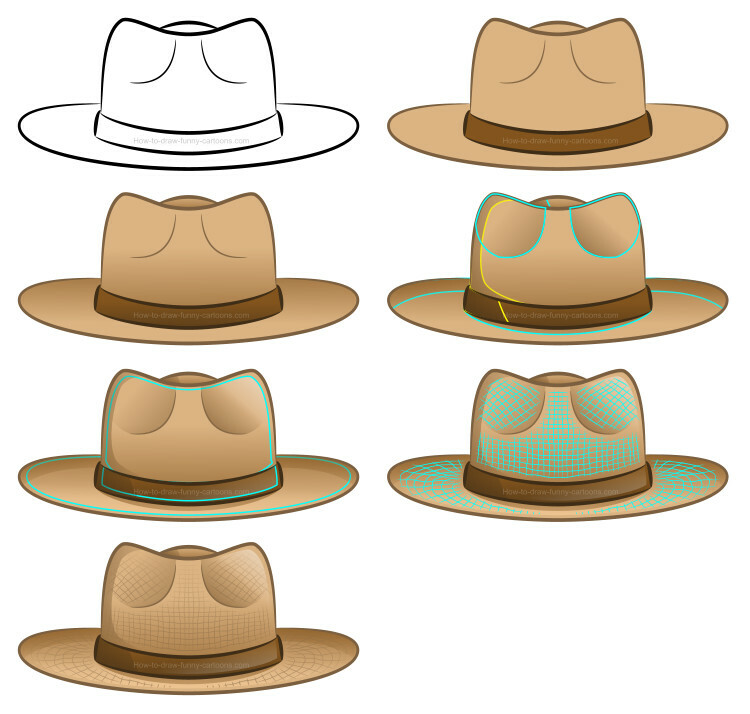 First, you can add a beige color on all parts of the clipart hat. The stripe can be colored in brown. To make the drawing more appealing, you can also modify the color of all outlines and strokes. In this example below, all lines are filled with a dark brown color. Since the stripe is darker, all lines surrounding it are also darker. One simple tip to add volume to a drawing without working too much (if you are using a vector application) is to use color gradients. Basically, our goal is to add two different versions of a color (one lighter and one darker) inside the same shape to create depth. See in the illustration below how the stripe seems darker on the bottom and brighter on top. Color gradients are nice, but adding new shadows manually is even better. You can start by drawing new shapes on areas that are mostly affected by the light source. These new shapes can be seen below. They are represented with blue and yellow outlines. All new elements are filled with dark brown colors. However, these shadows must be subtle to be effective. Strong shadows are great to create dramatic effects, but it's not what we are looking for here. We need shadows that are subtle and visually realistic. That's why it's important to use transparency to make the whole thing more appealing. Partially transparent shapes are perfect for this task. Next, we need to create brighter areas to create even more volume inside our clipart hat. Highlights are not mandatory, but it's a nice addition if your goal is to reach a higher level of realism. Just like the previous step, all shapes are shown with a blue outline and are filled with transparency for a more subtle result. Textures are also great to create realistic cartoon illustrations. In this case, no need to draw complex patterns or shapes. Only a few basic lines with pointed ends are required. To make this effect even more interesting, simply make sure all lines are irregular. These lines are currently shown in blue. You can see the final result in the next step. a beautiful clipart hat that looks cool!